The emergency is not over and every department in the country is now affected. MSF staff treat a child suffering from cholera-like symptoms in Sarthe. The cholera epidemic in Haiti has stabilized in the Artibonite region, but continues to spread in the northern and southern parts of the country. The emergency is not over and every department in the country is now affected. This past week, more than 1,850 patients with cholera and cholera-like symptoms were treated every day in MSF and MSF-supported structures. Doctors Without Borders/Médecins Sans Frontières (MSF) continues to operate 47 cholera treatment centers (CTCs) throughout Haiti and is planning on opening more in the near future to serve areas that are newly confronting the disease. CTCs should open soon in the southern towns of Les Cayes and Jeremie. Additional exploratory missions, as well as communications programs that have the goal of educating populations about the nature of and treatment for cholera, are being conducted elsewhere in the same region. Overall, MSF has more than 4,000 staff members working on cholera in Haiti, and MSF teams have treated more than 75,000 patients since the start of the epidemic. Some 13,000 new patients presented in the past week across the country. In Port-au-Prince, there was a big spike in the case load at the beginning of last week. Traffic in the capital was snarled and mobility was limited during the days of unrest that followed the announcement of the preliminary results of the presidential election. Overall, the numbers at MSF’s CTCs in the city jumped from 2,000 new cases two weeks ago to 4,100 cases last week, though the rate of progression slowed this past weekend when the situation in the capital stabilized. Overall, MSF’s cholera teams have treated more than 21,000 people in the capital in the past two months. In the Nord department, there were more than 3,500 new cases last week, but there wasn’t the same kind of rapid increase as there was in Port-au-Prince. Overall, the situation in the department seems to be stabilizing as the numbers of new cases plateau. 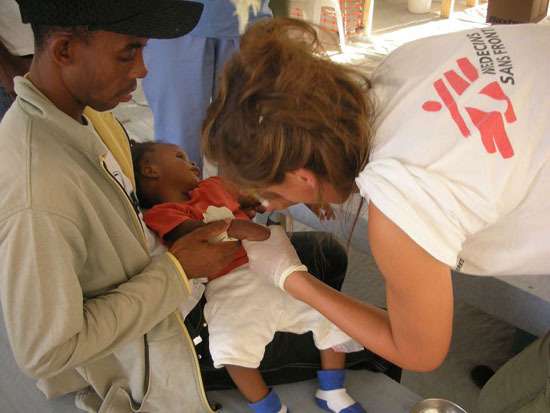 In the Nord Ouest department, MSF treated more than 1,100 new cases last week. That brings the overall number of cases in the area to approximately 7,000, but the caseload seems to be stabilizing there, as well. The same goes for the northern parts of the Artibonite region, where the epidemic began. In the southern part of Artibonite, the numbers actually began to drop last week. Overall, there were 1,200 new cases in the whole of the region, pushing the totals there above 26,000. There were also 250 new cases in the Ouest department, not including Port-au-Prince; and in southern Haiti there were more than 100 new cases in the Sud Est department; 130 in the Sud department; and 200 in Nippes, where there had not been any cases previously.